May 2nd served as the rain date (due to rapidly-overcasting conditions on April 25th) for our first Beaver Lake Nature Center lecture of the year – The Guiding & Wandering Stars – Key Northern Constellations & Planet Observations. On hand to run scopes and engage in lecture duties were the author with a 12.5″ New Moon Telescope Dobsonian, Larry Slosberg with one Meade SCT and Bob Piekiel with another. The Constellations have been with us for thousands of years, but there are only a few good, clear nights each month to memorize their positions as they slowly move across the sky! This outdoor lecture by the CNY Observers (www.cnyo.org) will briefly describe the history and importance of the Constellations as mythological, agricultural, and navigational guides, then will describe a simple system to begin to learn their relative positions. At the same time, Jupiter and Saturn are on opposite sides of the Southern sky, making excellent targets for binocular and telescope observing. Free and open to the public. While the week including May 2nd will be known to some as a particularly bad week for maple tree allergies, the nighttime sky stayed quite clear and the bugs eventually froze around us to produce an excellent session. The attending crowd of about 35 served as test subjects for both our two new brochures (How The Night Sky Moves and Guide For New Observers) and our first official completely outdoors (Powerpoint-free) lecture (which, despite astronomy being such a visual hobby, worked will with just the brochure contents). In anticipation of some nighttime brochure reading, I put together some red light flashlights on the cheap locally. For anyone attempting similar, I found a four-pack of Dorcy AAA 6 LED Flashlights at Dicks Sporting Goods for $10. Some very minor surgery is needed to remove the top caps, but conversion to red light flashlights is straightforward with the help of a four-layer stack of red acetate purchased many moons ago from Commercial Art Supply in Syracuse. Despite a little confusion about the start time (7:30 or 8:00), everyone had pulled in by 7:45 p.m., so we began the session with a good 30 minutes of physics. The goal of these Beaver Lake lectures is to not only observe objects, but to explain why the sky moves as it does so those trying to learn new constellations will understand what to expect both over the course of a night and over the course of a year. This began at the ground floor – understanding how the Earth moves around the Sun. 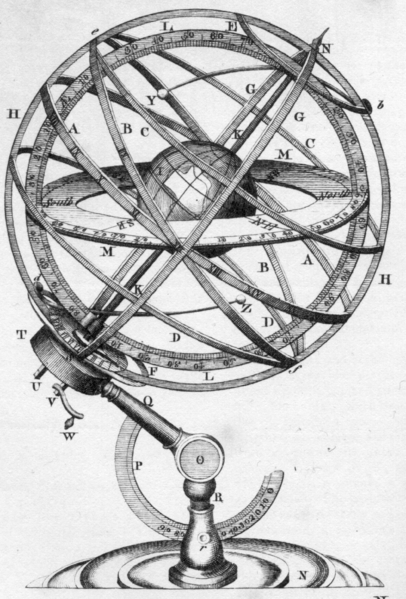 With the help of an armillary sphere (which holds the Earth at its 23 degree tilt – see the image at left from wikipedia), the Earth’s movement around the Sun was demonstrated, specifically showing that the rotation axis stays pointed the same way as we revolve – thus resulting in Polaris appearing not to move over the course of the year despite the Earth shifting position by 300 million kilometers (2 astronomical units) every 6 months. Knowing that Polaris is always in the same place in the sky (whether it’s daytime or not) leads smoothly into a discussion of the circumpolar constellations and the benefit of learning these six constellations first (for this discussion and some how-to’s, I refer you to the CNYO brochure: Guide For New Observers). Running a sunset-to-late-night session with a non-cycling crowd has (at least) two distinct advantages. First, the importance of dark adaption and the need to avoid smart phones (or avoid their use around others) can be stressed early in the evening. While enforcing protocols to maintain dark adaption at any kind of public lecture is usually a losing battle, anyone answering a phone did it in a very non-obvious manner, which was most welcome. Second, the mechanics of my Dobsonian telescope and Larry and Bob’s two motorized SCTs could be presented while still visible to attendees. More importantly, the proper observing technique for all could be demonstrated by showing (a) how to approach an eyepiece (I tell people to put their hands behind their back and simply lean into the eyepiece) and (b) just how easy it is to nudge a scope away from its target. Specifically for the Dob, I’m sure anyone who’s brought their scope to a public session has had at least one person lean on or pull closer an eyepiece. I’m pleased to report that, once the observing started, our collective intro to scope workings made my Dob-running life simple with no unplanned re-adjustments (just adjustments of the unmotorized kind). As stated in a previous post (2013 March 8 – At The Syracuse Inner Harbor), new observers are best introduced to observing with easy objects that don’t require training. Deep, dim, distant galaxies are not useful starters for someone with no background in eyepiece observing. For my part, a good 70 minutes were spent on Jupiter (low in the Western Sky with all four Galilean moons present), Saturn (low in the Eastern Sky and my first view of it this year), Arcturus in Boötes (its shimmering in the sky both with and without magnification was a point of discussion for several near my scope), M13 (the globular cluster in Hercules, which served as a first “way out” object and an example of using the constellations as a “coarse adjustment” for finding Messier and other objects), and the pair Alcor and Mizar in the handle of the Big Dipper/tail of Ursa Major (to show the separation and additional detail that comes with magnification). With a much smaller crowd around 9:30 p.m., I did treat a few interested parties to some more difficult observing in my scope – The Leo Triplet – after first briefly explaining the mechanics of averted vision. Of the five people who looked, all could make out M65, all could at least tell that something “was there” where M66 rested, and three people could tell that “something else” was there at NGC 3628‘s position. And I did miss a golden opportunity to observe NGC 4565 (my personal favorite) in Coma Berenices. We closed up shop at 10 p.m., just as Cygnus and Lyra began to peak out over the horizon and announce the approaching return of our Summer Constellations. I am pleased to report that we will be hosting a Summer Session on Thursday, August 8th (with an August 15th rain date) where we will again do a little bit of mechanics and instruction outdoors, followed by Saturn, Venus, and all that our summer view of the Milky Way can provide. CNY Observers (CNYO) hosts an introductory lecture to the Night Sky, focusing on planets and other objects observable during August and September. Part of the lecture will discuss some simple ways to learn the Constellations, while the rest of the lecture will provide details about meteor showers, observing satellites and the ISS, and the ever-expanding description of our own Solar System. If time and weather permits, some early evening views of Venus and Saturn will be had from the Beaver Lake parking lot. Free for members; $2 for nonmembers.